The 2 Steps to Set Up Success! 📍 Want to play around with AdvicePay first? Create a test client! To add a new client and request payment together in only a minute, we've got you covered! Start by going straight to Invoices > Request Payment or Subscriptions > Request Payment. Click the + Add New Client link in the Client drop down to invite your new client, then proceed to finishing the payment request. 3. 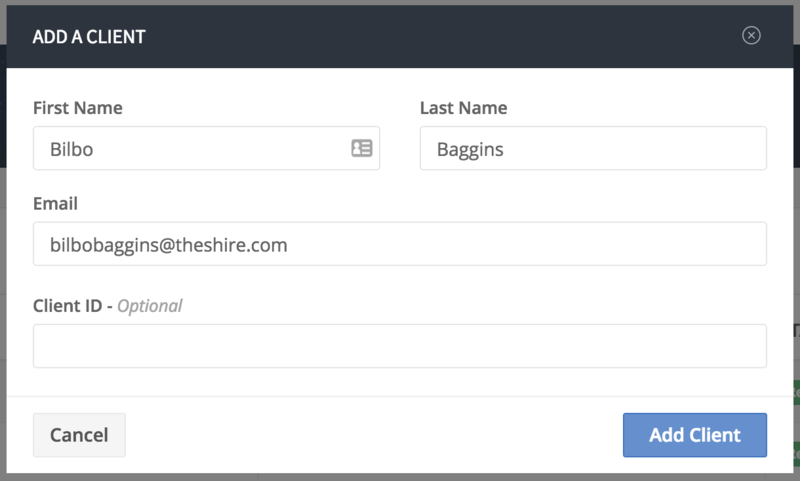 Enter in your client's First Name, Last Name, and Email Address (they can update all of this information later under their own account). You may also assign an optional, internal Client ID. Your client is now added -- woohoo! When you request a payment you can send them the invoice email notice and they will be able to set up their account from there. Alternatively, you can send over their unique Client Account Invitation link (located on their client page) so they can register their account separately from paying an invoice. To do that, copy/paste the link and send it yourself or click the paper airplane icon next to the invite link and we'll send an email for you! Basic plan accounts can add up to 10 clients, while Professional and Enterprise accounts may add unlimited clients. More information on our plans can be found here. 📍Read more: What emails should I have AdvicePay send to new clients? Learn how to request a payment from your client by following the below tutorial. 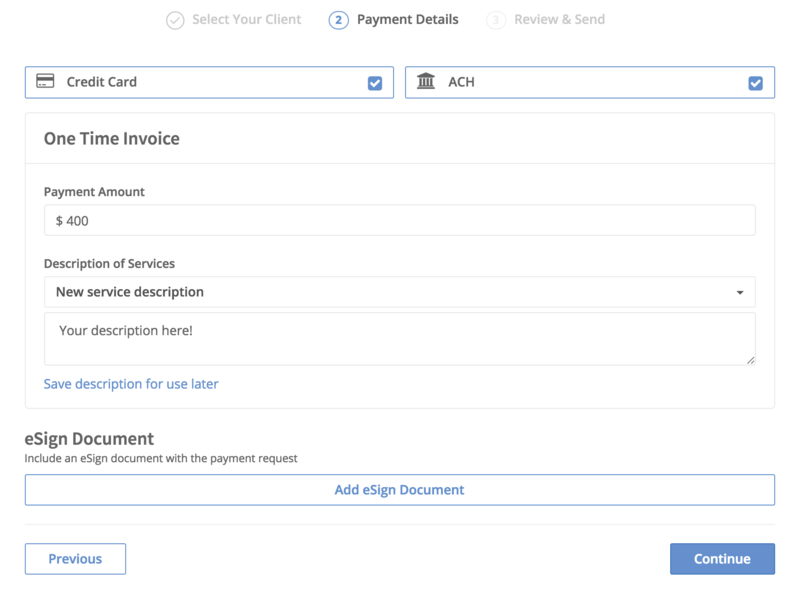 If you'd like to issue a subscription payment request in the same step as issuing an up-front, one-time payment, check out our new Advanced Payment feature further down in this article! 2. Click Request Payment in the upper right-hand corner of your screen. 3. Select your Client (this is searchable by typing within the drop down menu box), Invoice Type (One-Time or Subscription), Due Date or Start Date (a date on which you would like a subscription to begin billing), and Frequency if you are setting up a monthly, quarterly, or semi-annual subscription. 4. By default both Credit Card and ACH are selected as payment method options for the client. To limit the invoice payment method to ACH only, uncheck the Credit Card box (and vice versa). See more information on payment methods here. 5. Enter in your Payment Amount and select or write a Description of Services. You also have the option to attach an eSign document with the payment request. 5. On the final screen you can review the complete invoice details. When you're ready to send it to your client, click Finish! Choose Send via email through AdvicePay if you'd like your client to instantly receive an email from AdvicePay inviting them to view the invoice, sign the contract (if applicable), and proceed to payment. 📍Important: Based on your unpaid and overdue email reminder settings, your client could later receive an email notice about their invoice even if you initially choose to publish it without sending the email. To view or manage your settings, please click here. To send the email invoice notice yourself to a Registered client, you can copy/paste the provided URL and send that to your client. If the client is still Unregistered, you can include their Client Account Invitation link so they can set their password and proceed to payment. This option is available on Professional and Enterprise plans only. Please see more about our plans here. We know you want billing and making payments to be a breeze, so we’ve given you the ability to request an up-front, one-time payment from your clients at the very same time as requesting a subscription payment. 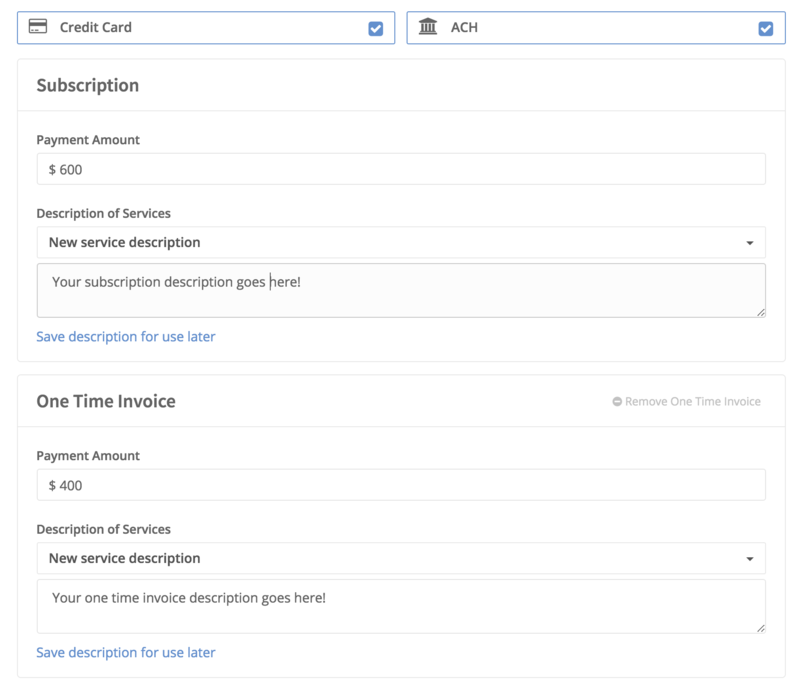 This way you can charge a subscription client for your initial fee or a partial month’s work without needing to spend extra time going back in and create a separate one-time invoice. Once the client has authorized payment on the invoice, the one-time charge will bill immediately and the subscription won’t bill until the due date you set. From here you can set a separate due date for the one time invoice. Then click Continue. 7. Now finish creating the invoice as illustrated above! Tip: The subscription invoice as well as the one-time invoice attached to it will appear under Subscriptions in your sidebar, as well as on the client's individual page. Can clients make late payments? Do I need to issue a new invoice if my client misses the due date? Yes, clients can still make a payment if it's past due! For one-time invoices, the client will be billed as normal once they go in and make the payment. No new invoice is required. For subscription invoices less than 30 days overdue, their payment will be processed immediately once they authorize the subscription, and then it will begin billing as normal the next month on the day you selected. No new invoice is required. Can I cancel an invoice without the client being notified? Yes, if it's still unpaid or it's an inactive subscription! If your client has made some action on the invoice (e.g. they've authorized a subscription) then we will send them an email notification letting them know it's been canceled. What emails should I have AdvicePay send to new clients?